AMG Wealth Solutions LLP – AMG Wealth Solutions provide a full range of comprehensive financial services. We can advise on Pensions, Investments, Life Assurance, Critical Illness cover, Income Protection, Accident, Sickness and Unemployment (ASU) cover and Mortgages. 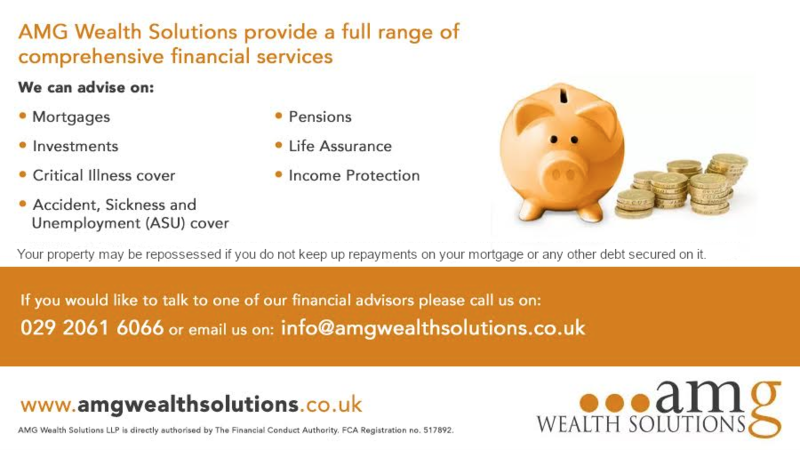 AMG Wealth Solutions provide a full range of comprehensive financial services. We can advise on Pensions, Investments, Life Assurance, Critical Illness cover, Income Protection, Accident, Sickness and Unemployment (ASU) cover and Mortgages. If you are looking to mortgage or re-mortgage then look no further than AMG Wealth Solutions. Based in Rhiwbina, Cardiff we have a team of mortgage experts who are able to scour the entire market place to find the right solution for you. We’ll carry out a detailed analysis of the market to find a suitable mortgage to meet your specific needs or examine how a re-mortgage could provide you with immediate savings in the most effective way. Furthermore, as independent financial adviser we have the expertise to ensure that your home is protected should the unthinkable happen. If you would like to talk to one of our financial advisors please call us on 029 2061 6066 or e-mail us directly. AMG Wealth Solutions LLP is directly authorised by The Financial Conduct Authority. FCA Registration no. 517892. Registered Office: 7 Heol-Y-Deri, Rhiwbina, Cardiff CF14 6HA | Telephone 029 2061 6066.